A BEST-SELLER! UPDATED AGAIN.. WITH EVEN MORE CUTTING-EDGE INFORMATION! 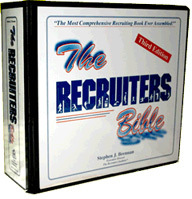 THE RECRUITER’S BIBLE-THIRD EDITION is the only book of its kind that teaches coaches how to recruit. This massive text (500 pages with 18 tabbed sections) touches all the bases for the novice and experienced college athletic recruiter. Technical skills are coupled with mental skills training to give the recruiter a distinct advantage over the competition. Numerous checklists, surveys, work sheets, inventories, and questionnaires supplement the content. Sample section titles include "Know Yourself";" Information Gathering";" Making Contact - Phone;" "Making Contact - Mailings;" Making Contact - Home Visit;" Making Contact - Campus Visit;" and "Gaining the Recruiting Edge - The Psychological Factors." An Appendix section offers fundraising ideas, recruiting recommendations from parents and athletes, information on recruiting the foreign athlete, and much, much more. If you recruit, you MUST have this resource in your personal library! "The Recruiters Bible provides coaches with a blueprint for success. Organization and preparation are the keys to success for any athletic program, and The Recruiters Bible helps coaches implement their recruiting plan in a first-class, professional manner."